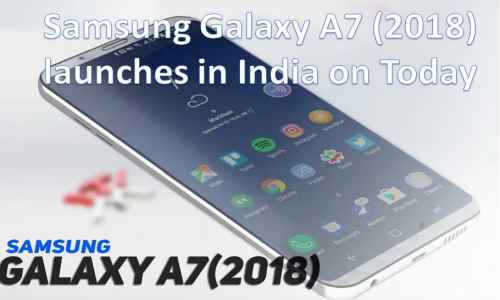 Samsung Galaxy A7 (2018) was launched last week in the global market. Now, this phone is ready to bring India today. The new model of the Samsung brand will be launched in India on September 25. Meanwhile, a teaser has been issued on the e-commerce site Flipkart. This is an upgrade to the Galaxy A7 (2017) launched in March last year. Samsung Galaxy A7 (2018) has a full-HD + Super AMOLED Infinity display and there is a setup with three cameras on the back. Other features include Dolby Atomas audio technology, the fingerprint sensor on the edge and selfie camera of 24 megapixels. Flipkart has made a microsite live for Samsung Galaxy A7 (2018). Here the date of the launch has been disclosed, along with some important specification. The microsite offers a glimpse of Samsung's phone's thin bezel display, and a better camera is also claimed. The AR emoji feature is also confirmed from the page. On the other hand, Samsung Mobile India has announced the launch of Galaxy A7 (2018) from its Twitter page. This phone will be presented at the event at 12 noon in New Delhi on Tuesday. The Samsung Galaxy A7 (2018) connectivity features include 4G VoLTE, dual-band Wi-Fi 802.11 AC, Bluetooth 5.0, GPS, GLONASS, Baidu, and 3.5mm headphone jack. The battery is of 3300 mAh. The dimensions of the smartphone are 159.8x76.8x7.5 millimeters and weighing 168 grams Galaxy A7 (2018) has given accelerometer, gyroscope, proximity sensor, RGB light sensor, and fingerprint sensors.